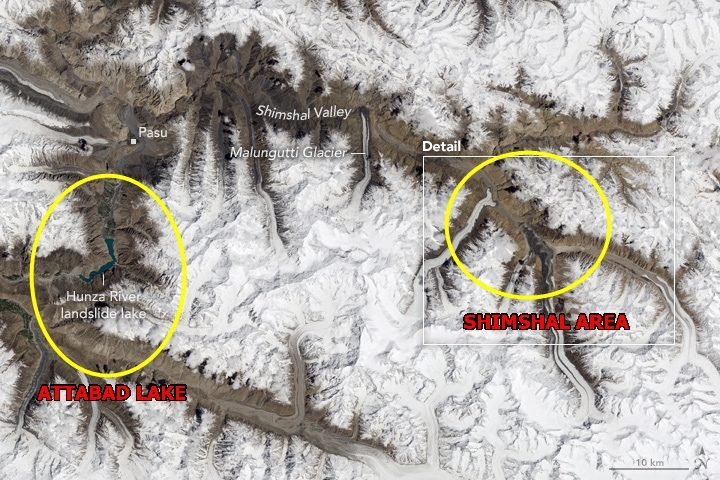 Why NASA is worried about Shimshal Valley? While travelling on Pakistani section of 918 km long Karakorum Highway (N-35), we take a right turn near Passu over Hunza River onto a road that moves along Shimshal River and leads deep into Shimshal valley. This “Mountaineers Valley of Pakistan” has various PakPeaks around it including PakPeak Distaghil Sar (7885 m), PakPeak Shimshal White Horn (6303 m), PakPeak Minglik Sar (6150 m), PakPeak Lupghar Sar (7200 m), PakPeak Yazghail Sar (6000 m) and PakPeak Kunjut Sar. Owing to presence of such huge PakPekas several glaciers flow into the Shimshal Valley perpendicular to the flow of the Shimshal River. Four of these glaciers are at the center of scientists attention at NASA monitoring the impacts of global warming. 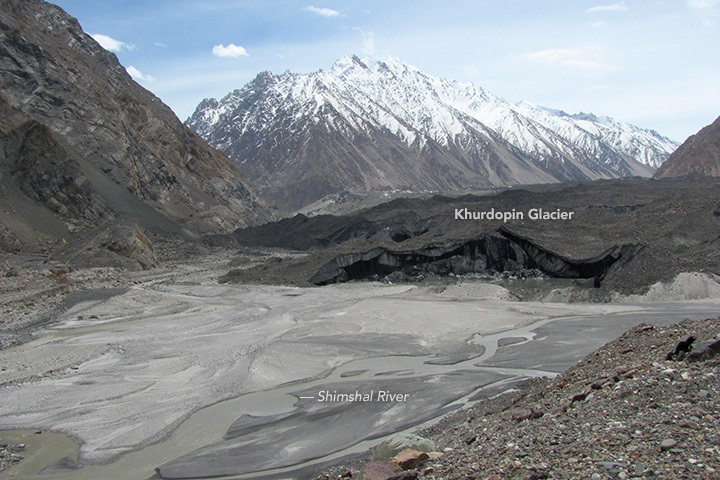 These four glaciers are Khurdopin, Yukshin Gardan, Yazghil, and Malunguti. Once these glaciers slides and bump into the narrow valley they have little room to move before meeting with the Shimshal River. This little maneuvering space can result in blocking of the river itself. More recently activities occurring in 47 km long and located at an altitude of 5800m, Khurdopin Glacier are the main cause of scientists worry.After showing marginal movement over the years , the gigantic Khurdopin Glacier began to rapidly advance in October 2016. By March 2017 it was accelerating at an astonishing rate of roughly 20 meters (65 feet) per day which is one of the fastest rates observed for a glacier in this region. This resulted in creation of a sizable glacial lake. However by July 2017, the river had carved a way out through the glacier before the lake could grow extremely large. In late July 2017, the size of the lake dropped from 100,000 sqm to about 40,000 sqm in a few days causing a flood downstream that damaged bridges, farmland and a key road.By August 3, 2017, the lake had completely drained. The rapid draining of even a relatively small lake can have dramatic consequences downstream. Historical records show that surging glaciers have triggered at least 20 of these glacial lake outburst floods over the past century—making the valley one of the most vulnerable in the Karakoram. Pakistanis can still recall a not too different incident when in 2010, in the Attabad area near Hunza a massive landslide blocked the river and created now famous Attabad Lake. 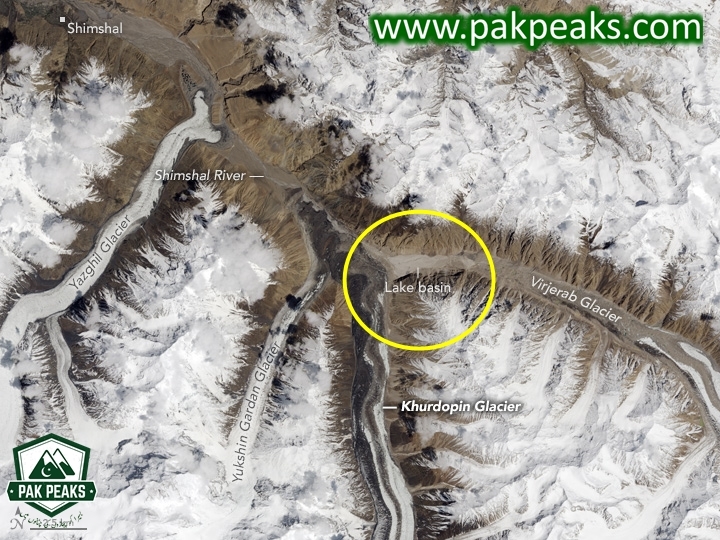 The possibility of a rapidly moving glacier like Khurdopin blocking the way of River Shimshal, creation of a natural dam and associated glacial lake and eventually breaching of natural dam with a catastrophic floods downstream might be worst case scenario but is a plausible scientific reality.